There are few things that invoke the spirit of the West, and especially Texas, the same way a good whiskey does, so much so that it cannot be an accident that the word “spirit” can be used to describe both things. 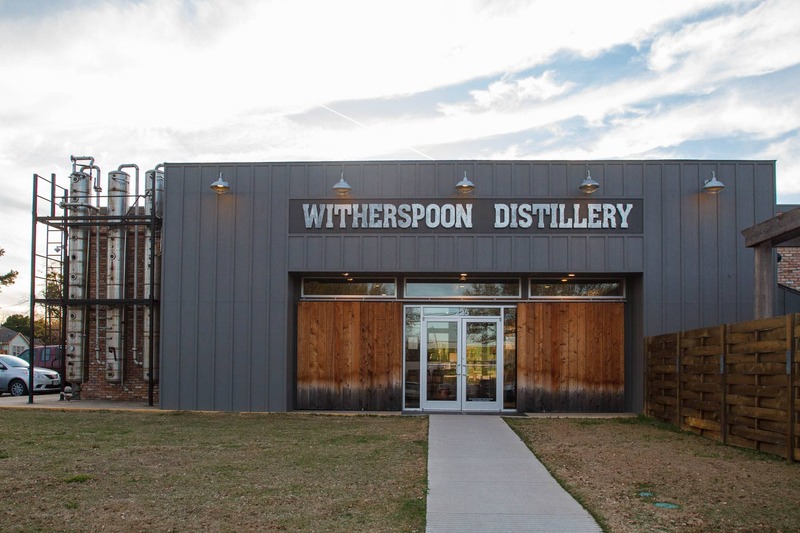 Recent years have seen an explosion of breweries, providing endless varieties of beer, but the good news for those of us who like stronger stuff is that there are also more and more distilleries popping up in North Texas. Part of the reason for this is Texas climate, which with its cycles of extreme heat and bitter cold creates perfect conditions for aging whiskey – while our friends on the British Isles wait for 12 or more years for their liquor to reach its full potential, over here we can squeeze the flavor from an oak barrel in a year or two. If you should be so inclined to spend some time tasting local whiskey offerings (and also vodka, gin, rum, etc), we provided a guide, consisting of five area distilleries that deserve your attention. These are small operations, unwilling to compete on volume with 800 barrels a day production of the big names you’ve heard of, and instead choosing to carefully craft their beverages, using primarily local ingredients and truly distilling the spirit of Texas. Some you can find on a shelf of your local liquor store, but others you can only buy at their location; all are well-worth seeking out. Here they are in the ascending order of distance from Frisco City Hall. As a Marine, Quentin Witherspoon was stationed in Africa for a time and learned two things there: how to purify water, and how to make brandy from beer and wine. After he returned to Lewisville, he used that knowledge and opened Witherspoon Distillery, a block or two away from Old Town. They recently moved into the old Piggly Wiggly building that gave them bigger production capacity, but also allowed room for a bar and a great patio where you can regularly hear local musicians entertaining the guests. Quentin and his crew are tinkerers – the core of their business is the smashing Texas Straight Bourbon Whiskey that is outstanding both on its own or in an Old Fashioned you can get at the bar, with their house-made orange bitters. They’re also known for their River Rum (both white and spiced), which they use for their fantastic rum cake. But lately, they’ve been experimenting with aging their whiskey in sherry or port casks, which adds another great layer of flavor. There’s also the White Dog, the unaged whiskey which may have a sweet smell, but will bite if you’re not careful. Best of all, from time to time they produce a limited run of “single malt” whiskey (you cannot use that other word on this side of the Atlantic!). Instead of 12 or more years, Witherspoon aged their single malt only 14 months and won a silver medal at a recent international competition. The house bar also serves gin and “the agave spirit” (again, they can’t use that usual word since they make it on this side of the border), they have a Small Bites menu, and there’s always a food truck just outside if you’re really hungry. Their merchandise shop will also have some mind-blowing bourbon-filled chocolates (don’t bite, let them melt in your mouth! ), a variety of t-shirts, and other interesting items, such as a beard comb made from one of their used-up whiskey barrels. John Straits and Evan Batt, while working for a Russian vodka company had an idea – why not make the stuff right here in Texas. That way, if someone “absolutely” needs to get a watermelon vodka or cucumber vodka or name-your-flavor vodka, instead of grabbing the imported bottle at the liquor store, they can get it from a couple of local guys in Carrollton, TX. They even add a little food coloring to it! To further emphasize the difference from the “eastern” tradition of making vodka, and with a gaze to the future, they named their distillery Western Son. Things took off quickly and in 2015 they moved into a massive facility in Pilot Point, where they’re already bursting at the seams. They have a tall column still for vodka with 10 copper plates, so it gets distilled 10 times from 100% corn. From there it goes into several blending tanks where flavorings are added (blueberry and prickly pear are most popular). Part of the reason why they only have tours on Saturdays is that their state-of-the-art bottling line works all day Monday through Friday to satisfy the demand. Western Son is a brand in full swing (their 2018 goal is to be in 48 states), and in addition to the booze and the merch, they also serve live music shows in their courtyard. For a full schedule of their summer concert series, visit their website. Oh, of course they make whiskey, too! Aging barrels for Red River Bourbon are all over the place, and they make several varieties – from the Single Barrel premium whiskey all the way to “Canadian Style” blend, for fans of that popular royal brand. They finish their whiskey by aging it for 6 months in Pinot Noir barrels. There’s one more surprise in those aging barrels – some of them contain gin! As-is, their Texas Gin is more cucumber than juniper, but after a trip to the whiskey barrels, you get the gin start and a whiskey finish in your gin-and-tonic. Fun fact: Cognac, France and Denison, Texas are sister cities. For more on that, look up the incredible true story of T.V. Munson, which was in part an inspiration to the brothers Jonathan and Robert Likarish to start making brandy from Texas-grown grapes and other fruits. They named their distillery after a local grape varietal with especially resistant roots – Ironroot Distillery. Today they make several whiskeys as well as vodka and gin, all using local non-GMO ingredients and traditional French techniques, and they’re looking to make single malt whiskey and peach brandy soon. They will tell you with great pride that 95% of the grain they use comes from no farther than 60 miles from their distillery, another true grain-to-glass distillery. Ironroot whiskeys aren’t for the faint of heart – their Harbinger bourbon clocks in at over 118 proof. Its special blend of corns (heirloom “bloody butcher”, heirloom purple, and North Texas yellow dent corn) won them a double gold medal at a 2016 competition in New York. If you’re into corn whiskey, try the Hubris, which won a recent competition in the Best American Corn Whiskey category. If you’d rather take the foot just a little off the alcohol content pedal, you will love the Promethean bourbon, a delicious blend of four different corns and rye. In my spare time, I’m a gin drinker, and Ironroot’s Texas Drought Gin was just what the doctor ordered. Instead of being juniper-heavy like the British gins that can be found at any liquor store near you, this is a more Western gin, with high citrus notes (lemongrass grown on the property), and pecans providing a unique Texas flair. If you’re more of a Moscow Mule kind of person, ask for a Denison Donkey at the bar and get smacked with their vodka and its natural subtle caramel flavors. As I mentioned previously, if you find yourself cruising north on US Highway 75, be sure to take the Loy Lake Road exit and visit the Ironroot brothers. 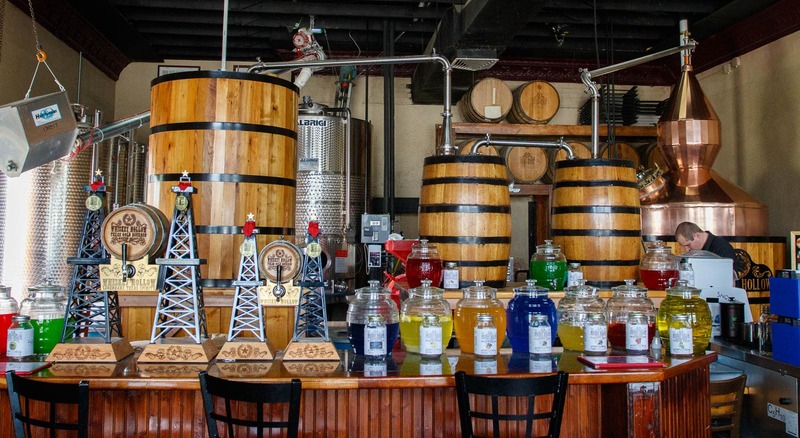 If you appreciate good liquor, you’ll enjoy a lengthy drive in the other direction, to Trinity River Distillery, located just east of Downtown Fort Worth. The century-old building with the big “Texas Silver Star Whiskey” sign used to belong to the Ranch Style Beans company; because of its historic status it does not contain elevators or escalators, so don’t come for the tour on a leg day – you’ll climb quite a few stairs. The distillery was started by a couple of Navy guys in 2011 in Lewisville and moved to its present location in 2015. The premises include a great patio and the bar area, where the tables are made of reclaimed boxcar wood for a neat throwback touch. Their 100% corn vodka is made in a tall still with 16 metal plates in it and then watered down to bottle-proof with harvested rainwater purified through reverse osmosis. Even though they have a “gin basket” in their distilling room, they have no plans to make gin, which was a bit disappointing to this particular gin drinker. They do make whiskey, though – branded “Silver Star Whiskey”, i’s aged for 2 years in American oak barrels and made of 75% corn, about 20% rye, and the rest of it is wheat and barley. It is really good, but the outstanding stuff was a sample of their single-barrel reserve bourbon, which we tried straight out of the barrel, at 120-proof. Yes, it was plenty strong, but really smooth with lots of interesting flavor notes. They are hoping to add it to their selection later in 2018. But the real reason to visit is their Texas Honey liqueur; they infuse the whiskey with real Central Texas wildflower honey, which brings down the alcohol content a little bit and adds a tremendously smooth texture and a sweet aftertaste. It’s a great cordial, great for sipping neat, but a few in our tour party had it in a Honey Pic, a cocktail with lemon and iced tea for a perfect refreshing end to a long week. Bourbon was not designed to age, but rather get to market as quickly as possible in its original, clear form – but that meant sloshing around in a barrel on a stagecoach for months over rough roads, which aged the whiskey quickly and provided the color and flavor. Moonshine did indeed use to make people blind – it was because in the old days the toxic methanol alcohol and other toxins (called “the heads”) was not separated from ethanol, the “hearts”. The final portion, the “tails” is usually low-level liquor, drinkable, but forgettable.